“We have only done 50% of the job because there is now the play-off,” the Italian said after Ireland’s crucial 2-1 win. The manager shouts instructions during the game last night. GIOVANNI TRAPATTONI INSISTS Ireland are ready to go. The Boys in Green secured another two-legged showdown for a place in a major championships with a 2-1 win over Armenia tonight, two years after they lost to France in a traumatic decider in Paris. Ireland will learn who’ll they face in a noon draw at UEFA HQ on Thursday. Despite plenty of confusion about rankings, UEFA and FAI officials confirmed that Ireland will be seeded in the first pool with Portugal, Croatia and the Czech Republic. That means Irish fans can look forward to a trip to either Bosnia, Estonia, Turkey or Montenegro. “All the second-placed teams are very important. 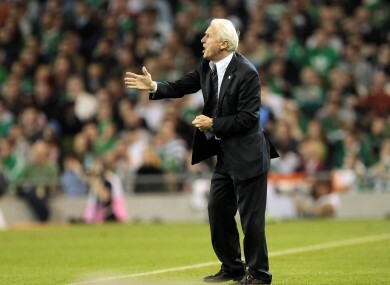 We must accept whichever team,” Trapattoni told reporters after the victory. “The first and second teams in the table are always great teams. But I think it would be better to play the first game away and the second at home. The Italian insisted he was not surprised with another impressive Armenian performance and hoped the game stood Ireland in good stead. “Armenia in the first half played very, very, very well and it was very difficult to control the game. They had more possession, yes, they played better than us in the first half, but I don’t remember any particularly difficult situations, no. Trap was, of course, vindicated in his selection of Simon Cox ahead of Shane Long up front. Cox took the man-of-the-match accolade after an excellent display alongside Kevin Doyle, who was sent off for two yellow cards. “It’s an unbelievable night for Irish football,” Cox told TV reporters, “We needed to get six points out of six (from the last two qualifiers), and we got them and gave ourselves the best possible chance. With Ireland’s next visitors to Lansdowne Road as yet unknown, Cox insists the Boys in Green are ready, come what may. “We showed tonight we can play as well as anybody and as I said it’ll be luck of the draw who we get, and we’ll take them and we’ll go full steam ahead into the game and we probably won’t even think about France or any other play-off defeat that we’ve had,” he added. Email “Trap awaits another date with destiny ”. Feedback on “Trap awaits another date with destiny ”.